My Mother, Jemima Mumford Tanner, was born in Tooele, Utah on November 19, 1859. My Father, William James Kimber, was born in England (in Hampstead-Norris, Berkshire) on July 20, 1854, and emigrated to America, arriving in Tooele, Utah in September 1868 by mule team. They were married in Grouse Creek, Utah Territory on July 4, 1889. 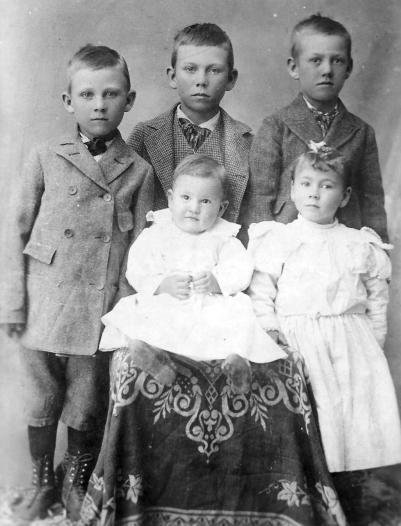 On October 3, 1891, I, Thomas Edward, joined the family, at the Kimber Ranch, as the second child. 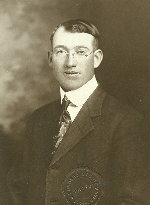 Brother William Charles (Bill) was then one and one-half years old. At age six I was taken to Grouse Creek to learn the “three R’s.” I wasn’t ready for the outside world, and let them know, and they took me back to the ranch to grow a little, and prepare for school and “boarding-out” at Aunt Lizzie Cook’s the next year. My first teacher at the old log schoolhouse was Penelope Betteridge. I still remember the time she kissed me. Other teachers through the years were Henry Blackburn, Mr. DeSpain, and Mr. Sartin. Oren Wilson was my teacher when I graduated at the new schoolhouse, which still stands as part of the present schoolhouse. (He and Chloe Kimber were the only graduates but they marched up and got their diplomas anyway) Our graduation party was held in the Kimber-Frost dance hall and skating rink. From then on, I was one of Dad’s ranch hands, until 1915, when I struck out for myself, and homesteaded in Dairy Valley, Nevada. In 1917 I entered the U.S. Army and I ended up in France in August 1918 with the 77th Division, until May 1919, then, back to the Kimber Ranch to work with Dad and my five brothers. I was called to be Counselor to Bishop Joseph Barlow, in October 1919, and married his niece, Emma Barlow, in the Salt Lake Temple on December 11, 1919. We lived at the Ranch until our family had grown to four members, by the addition of a son, Kendall and a daughter, Velma. Then, we rented a house in Grouse Creek from Heber Simpson, and later bought the house. While living here, Donna and Joyce were born. I learned a lot by shearing sheep, hauling ore, and working in the hay fields, and so on. When Bishop Barlow moved to Malta, our new Bishop, Wilford Richins, called me as his second counselor. When he moved to Idaho, I was called as President of the Mutual by Bishop John Hadfield. George Paskett and Dave Paskett served as my counselors. At this time I received a Life Membership in YMMIA. I still wear the pin on my suit. (Certif. No. 6678, dated April 4, 1929). When Elmer Kimber became Bishop, he called me as the second counselor. At this time, I had my own trucking business. (The majority of trips at this time were to Oakley and Burley, Idaho, hauling anything from feed and grain to shopping for ladies’ dresses. Later, with Kendall in the Air Force and Velma away, we found a home in Brigham City, selling out in Grouse Creek and moving the rest of the family to Brigham (August 1944). In 1965, Emma, my wife contracted a terminal illness, and suffered much until 1967 (February 7) when she was called to Eternal Rest. 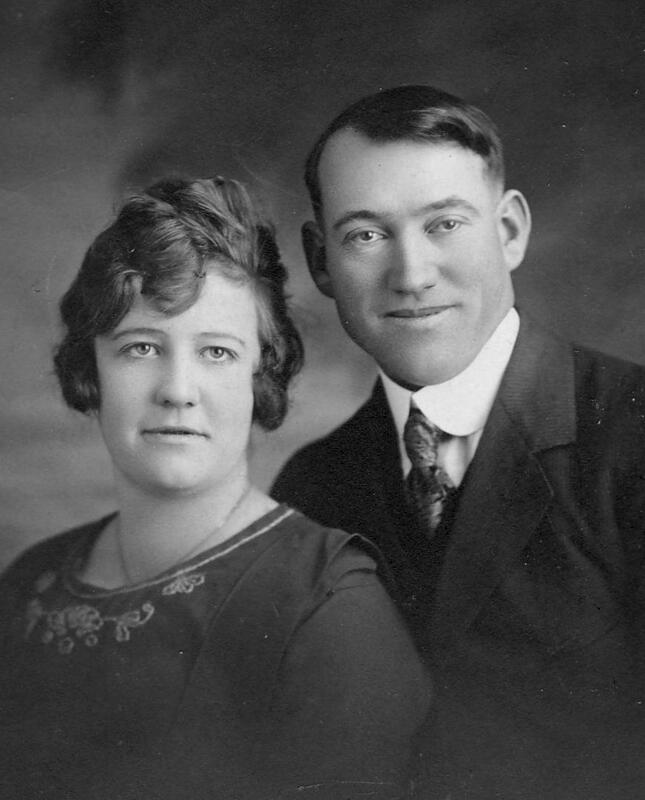 Velma married in July, and Joyce and family were living in Ogden, Kendall and family lived in Snowville, Utah, and our beautiful Donna had died while a student at the University of Utah in 1952 (at age twenty-one years). I was alone and lonely. At an LDS Sociables Dance I met a widow lady from Massachusetts, Mary W. Kane, and we were later married in August 1967, and enjoy continuous blessings. Later, I resigned as Church Custodian, and keep active with dancing and yard work, and Church assignments. Also I am now in the third year as Commander of Barracks #2951, Veterans of World War One, and always looking for eligibles for membership. A man of many talents – he had a basic knowledge of auto mechanics and machinery. He helped keep things in repair at the “Ranch,” running the sheep shearing outfit, always keeping his truck and auto well serviced, and trying to be prepared for any emergency that might arise while he was away from home. This was born of necessity, and learning to be self-sufficient was his goal. His family learned from him to plan ahead and “Be Prepared” as much as possible. He spent a number of years in the trucking business. The majority of his trips were to Oakley and Burley, Idaho, hauling everything from feed and grain to shopping for Ladies’ dresses. He usually posted a sign on our front gate telling when he’d be going to “Town.” The local Wakefield store was closed at this time, and people would bring their shopping lists to him. One time Johnny Richins asked if he could ride to Burley with him the next morning. When Ted stopped at his place to pick him up, Johnny had all his belongings and his family out by his gate, and Dad moved them in his one and a half ton truck – kids and all. He had a gas engine at Grouse Creek which he used to cut firewood for others. We burned wood all the years we were in Grouse Creek, and even after moving to Brigham. There was a fairly new cook stove and space heater in the Brigham house when we moved here. Among his talents, he quite enjoyed doing bits of carpentry work and building. In the Grouse Creek house, he made an upstairs bedroom out of part of the attic. He probably helped some with the big house at the Kimber Ranch. His brother Bill was a good carpenter. His brother, Lawrence, helped remodel the kitchen in the Brigham house. A pantry was removed, a back porch closed-in, and new windows installed making a large, handy kitchen. Extra cupboards were built, and a patio added in the back. He also built a carport. Here he displayed antlers from game animals he harvested. The Box Elder News featured him in their sports section on September 8, 1964, with a picture of him and the antlers and a complimentary write-up. 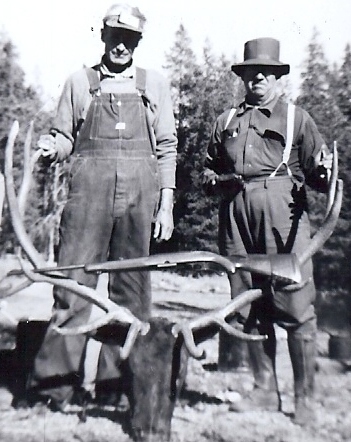 Not too long after, during a deer season, someone stole a prized set of deer antlers from his collection, which he got while hunting near the Kimber ranch, with twelve points on one side and thirteen on the other. He really felt bad when it was stolen. During the years he worked as custodian at the 2nd/9th ward chapel he was constantly trying to keep things in repair. Probably the most challenging duty was taking care of the old coal furnace. Shoveling coal, ashes, and cinders became increasingly difficult. Snow-removal, mowing, watering and cleaning were a burden as he got along in years, and the lifetime of hard work took its toll. One thing he really enjoyed making was a homemade hunting camp, or sheep camp. The frame was a pickup truck bed, and after using a fold-down couch as a bed and building the camp around it, it was very serviceable, and quite the envy of many hunters. He installed a wood-burning stove, built cupboards and bins, a fold-down table, insulated it well, added a kerosene lamp, and in fact, patterned it after a sheep camp. Storage boxes were added outside, and fold-up steps. Everything was built sturdily and heavy and serviceable. It’s hard to say which he enjoyed the most, building it, or camping in it in his later years while hunting with Kendall, grandson Fred, and assorted Kimber brothers, nephews, and friends. Thomas E. Kimber passed away at his home, 241 So. 4 W. Brigham City, Utah, in the early evening on September 19, 1975, with a massive coronary occlusion, having worked in the yard during the day, and was sitting in his chair, resting. Memorial Services were held in the LDS 2nd Ward Chapel on 23, with interment in the Brigham City, Utah Cemetery. Arrangements by Petersen Mortuary, Bishop Jay Valentine conducting, and Military rites at the cemetery accorded by World War I Veterans.